Light weight design makes it easy to carry and store. This classic plastic sled has built-in handles for your child to grip, grips are smooth so they won't cut or scrape uncovered hands, while the attached tow rope ensures easy pulling. Perfect for any hill! Whether they're new to sledding or have been sledding for years, the sled is guaranteed to provide hours of fun. The plastic design of the snow sled helps you shred down the mountain with ease. If you’re too tired to carry the sled after riding down the hill, it comes with a rope to help you pull it through the snow. 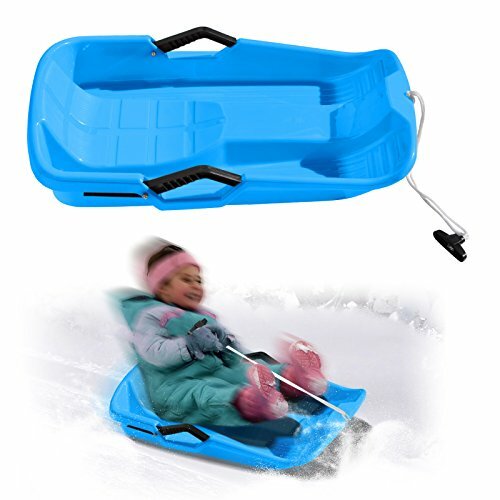 Pick up your sled board, grab your snow gear and hit the snow with this snow sled. Recommended for ages 3-15. Limited lifetime warranty. View More In Snow Sports.